Celebrate the holidays with free decorative painting patterns. 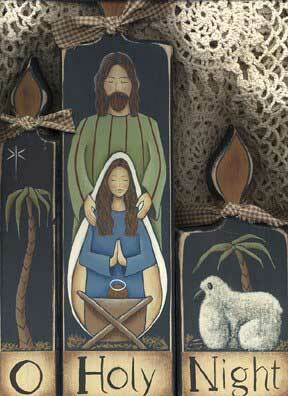 This unique nativity scene pattern will help bring back the simplicity of Christmas past. instructions permitted without consent from Donna Atkins. This is a simplified version of a design that will most likely be in my next book. I hope you all enjoy painting it ! IMPORTANT - General Painting Instructions: All shading is floated. When painting each area of the design, allow a small border of the blue background to show through (in other words, don't let colors of sections meet each other - allow a think line of blue to separate them). Joseph: Paint robe Wedgwood Green, allowing blue to show through around sleeves, neck, and above Mary's head. Transfer stripes and paint Candy Bar Brown. Shade under arms and behind Mary Dark Forest Green. Paint inside of sleeves by hands Dark Forest Green. Float 1:1 Flesh Tan/Wedgwood Green on top of sleeves. Hands: Paint Flesh Tan; shade Burnt Umber. Thin Burnt Umber and define fingers on Joseph's hands. Mary's Veil: Paint outside of veil (top and sides) Butter Cream, inside of veil Flesh Tan. Shade inside Burnt Umber.